Start your own Bookshelf program! Download the Bright Red Bookshelf Manual. The Bright Red Bookshelf program recirculates gently used children’s books back into the community where they are made available free for families to own. 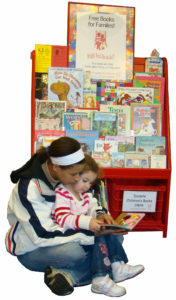 Books are collected in red crates at community locations and through book drives organized by service groups, congregations, campus organizations, and schools. These books are sorted, cleaned, and affixed with a label, then set out on bright red bookshelves at sites where low-income families will have easy access to them. Book ownership is important in fostering an interest in reading and a love for books. If parents are to read to their children, they need the books to do so. Children feel pride in owning their own books. They develop confidence in reading and acquire mastery when books are easily within reach and can be read again and again. We believe that each book a child owns is an “appetizer” to library use. Jim made a prototype shelf, board member Ed Palmer selected the perfect color red, and Ed’s daughter created the logo. Children’s author and carpenter Ed Ormondroyd and volunteer Michael Miles came on board to make additional shelves, and we were off! In the spring of 1998 the first shelf was inaugurated at the Ithaca Police Satellite Station, and soon five more were set up at other locations. A successful collection drive among local congregations, the first Faith in Books Weekend in fall 1998, brought in 1,400 books for the shelves. In the year 2002, congregations, groups such as youth hockey and girl scouts, and individuals donated 7,600 gently used books at bright red crates throughout the community. That year more than 5,000 books were added to home libraries from bright red bookshelves. Currently more than 10,000 gently used children’s books are recirculated into the community each year, made available on over 50 Bright Red Bookshelves in our county. View Tompkins County book donation sites and bookshelf sites.